Those searching for the best restaurants in London need look no further. Under the culinary direction of celebrated chef Adam Handling, Belmond Cadogan Hotel has something for every taste, at every time of day. Dine on exceptionally executed modern British cuisine in the restaurant, or enjoy a traditional afternoon tea experience in the Lounge. "Modern, British, seasonal, sustainable; that’s the ethos that underpins my cooking. I don’t want to be the best restaurant in the world—I want to be the local’s favourite in Chelsea." Celebrated chef Adam Handling is the visionary behind Belmond Cadogan Hotel’s stunning menus. Tipped by Caterer magazine as one of the ’30 under 30 to watch’, he combines his passion for traditional British cuisine with daringly modern flair and imagination. You can also experience his irresistible cuisine at his other restaurants in London—The Frog Hoxton and his flagship Frog by Adam Handling in Covent Garden. Experience British cuisine as you have never experienced it before at Adam Handling, Chelsea—our flagship restaurant. Framed by the hotel’s classic architecture and boasting an open kitchen, the stage is set for a culinary journey that blends both past and present. 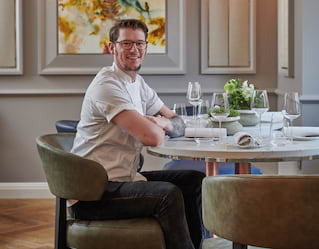 Under the guidance of Adam Handling, one of the country’s most talked about chefs, traditional regional dishes are reimagined as light, daring works of art. The very best seasonal, sustainably sourced ingredients are worked into a changing menu that is sure to take your breath away. With a design that echoes the hotel’s rich heritage, The Bar at Belmond Cadogan Hotel is a timeless and evocative space. After a morning filled with cultural exploration, the selection of wines and premium spirits are perfect for a late-afternoon tipple. A selection of classic British cocktails are the perfect accompaniment for cheese and charcuterie boards. Treat yourself to the best afternoon tea London has to offer. 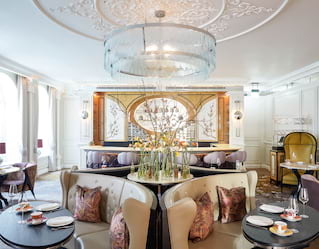 In the day, our classic lounge is set to impress, with a selection of teas and light snacks. It’s also the perfect space to enjoy a delicious light lunch. As the sun sets, the space transforms into a stylish evening lounge. It’s the perfect place to gather with your nearest and dearest for a nightcap before retiring to your luxury suite.